Many trends including multi-touch technology has made way to industrial automation, multi touch-screens in different forms are widely used in diverse industries. Primary reason is the accuracy, reliability and flexibility of multi-touch for the operators. Projected capacitive touch or Pro-cap technology is quite popular in the market, because of its resistance and powerful functionality that operates well under harsh working conditions. 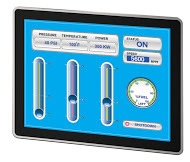 Arista Corporation series of panel mount multi-touch industrial displays provide customers complete HMI control and a customized monitoring system. The units are fast and easy to install and can be used with simple HMI or complex SCADA applications with multiple options. Arista Corporation is a pioneer in building, designing and manufacturing industrial displays and computers; we also provide a complete range of industrial-grade unit with latest technical specifications. The all new ADM-2100AP range of panel monitors is tested and embeds advance functionality for utmost productivity and efficiency. All units in ADM-2100AP range are multi-touch and can be availed in screen sizes of 15”, 17”, 19”, 21”, and 24” inches. ADM-2100AP multi-touch capacitive touch screens with projected capacitive touch (PCT) deliver reliable intuitive response and easy functionality. The ADM-2100AP series have ultra smooth industrial grade IP65/NEMA 4-4X ingress with active matrix LCD flat panel. Multi touch capability allows use of both hands so that operator has ease of using the functionalities without any discrepancy or hazard. Flush Bezel Panel Mount Design. With projected capacitive touch option users have accurate flicking and zooming options along with comfort.ADM-2100 AP range of multi touch monitors are not only perfect for harsh working environment but their sturdy design and finish gives utmost durability. Arista Corporation is proud to have a talented team of engineers who incorporate expert knowledge, research and efforts to deliver the best. Our dedicated sales team is available to help customers with information, quote and technical support at all times. Arista was formed in 1994, with offices in China, India and Taiwan. With decades of experience in engineering, manufacturing and customer support. Arista has years of experience and expertise in Industrial Panel PCs, Industrial Monitors, Box PCs & Fanless Embedded Computers, Rack Mount Computers, ACP Thin Manager Ready Thin Clients, Embedded CPU Boards and Video Extender/Switches. Arista has served customers with reliability, Integrity and Trust.